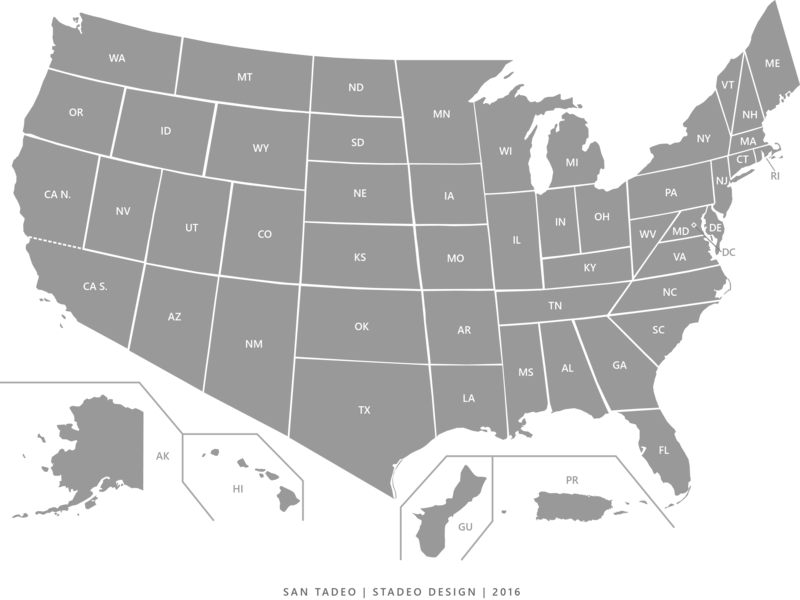 I have thought about “revising” the U.S. map/state lines for a while now. Think L’Enfant and Ellicott’s Federal City design. On a designer’s perspective, I have constantly become a little annoyed by looking at state borders that do not make any sense. Panhandles and Delaware’s Twelve-Mile Circle? Don’t get me wrong, I love history and geography and I often find myself browsing for hours through Wikipedia pages on how a certain state (or country, town, territory, etc.) came to be. Their history, after all is a part of what defines them as an entity. My thought process was not based on historical events or some failed ratification of law some time in history, it was based, sort of, on the already existing borders. Without political influences, the proportional map was made by superimposing the current state borders so that they can still be distinguished somewhat. I also drew parallel lines in order to form a linear border system on almost all of the states. The Proportional States of America, in order to become proportional, the state lines had to be further divided or extended. For instance, California would have to be divided into two states to prevent having a weird “L” shape. The US-Mexican border would have to become a straight (slanted) line extending from San Diego to the tip of Texas, in Brownsville. Panhandles are now absent (ID, OK, FL, and AK?). I do not consider this an “alternate history,” instead it is an alternative design of the United States, considering that all states joined the “Territories” at the same time in. Furthermore, the Proportional States of America would now have 54 states including the District of Columbia (DC), Puerto Rico (PR), Guam, and California (Sur). If you want to get answers and information about any of my work, services offered, or simply want to know more about me, get in touch!